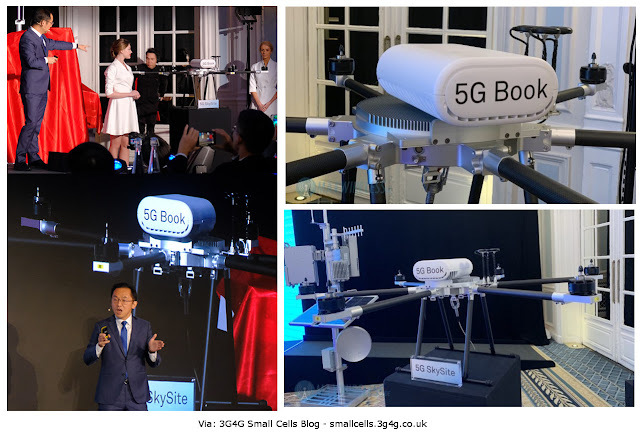 One of the announcements from Huawei that seem to have missed most of the articles, magazines & analysts is their SkySite Drone with a 5G Base Station and a RRU called '5G Book'. While Huawei calls SkySite as a drone with integrated 5G base station, I am assuming that the BBU (or CU in 5G) is located on the ground. The tethering is used for providing power as well as fiber for communication between the CU/DU on the ground as the '5G Book' RRU on the drone. EE was the pioneer of these tethered drones (called Airmasts initially and E.M.M.A. later) as you can see from this video by ThinkSmallCell here. The drone is designed for emergency coverage after a site failure due to technical issues or natural disasters like earthquakes or floods. The drone weighs just 7 kgs. Tethering allows the drone to be up for a few days. From my past experience, the limiting factor was the motors on the drone getting hot. It can still remain in air between 2-4 days. In his introduction, President of Carrier Business Group Ryan Ding focused on the vendor’s growing role as a provider of humanitarian communications solutions by unveiling the new Huawei 5G Skysite. Using a new ‘Book’ radio unit weighing only 7 kilos, 5G Skysite is 40% lighter than the outgoing 4G Skysite. The 5G Skysite antenna is supported 100 meters above ground by a drone and the entire base station can be set up in five minutes, to give between 30-40 square kilometres signal coverage.